This is a flat woodland course in which trees harmonize nicely with gentle slopes. Lakes and creeks make the course even more beautiful by drawing exquisite silhouette. It is rich in varieties, such as holes with trees, lakes and/or bunkers.Each hole is very unique. The fairway is well maintained, almost like a soft carpet. Since the fairways are relatively generous and there were many holes you can drive hard, I did not feel it was as difficult as the course rate of 73.7. However, it is still obviously a challenging course. A slight dogleg to the right. Trees line up on both sides of the fairway and make you feel the hole is narrower. The green is guarded by deep bunkers on the right and in the front and a hollow on the left. A slight dogleg to the right, difficult par 4. A carry of 260 yards is needed to clear the bunker on the right hand side of the fairway. The bunker on the left side of the green comes into play on your second shot. A straight par 5. It is possible to hit the green in 2 with a tail wind. The second shot is over the lake. The second shot should be hit onto the wide part of the fairway to the right to avoid a series of bunkers, 100 yards long, on the left. A short, gentle downhill par 4. The fairway is narrow and trees of both sides of the fairway look like hanging over, so the tee shot is difficult. The green is wide and a deep bunker in front of the green is in play. This bunker stands in your way like a wall, and is deep and long, therefore a good technique is required to just escape from there. A par 5 with a unique layout. This hole is divided into 3 parts by creeks meandering through the fairway. Two fairways are prepared off the tee and the creek is running through the center of the right-and-left fairways. To hit the green in 2, driving onto the left fairway across the creek is easier to aim the green on the next shot. If you lay up on the second shot, driving onto the right fairway is safer. The highly undulated green is surrounded by bunkers and a lake, so an accurate approach shot is required. A beautiful par 4 with a gentle dogleg to the left. The left side of the fairway and the front side of the green border a lake. The green is wide. This is not a long hole but need to be careful. A slight left dogleg. A strategic par 5. There’s a lake on the left, which is 270 yards off the tee. The second shot needs to clear the lake. e left, which is 270 yards off the tee. The second shot needs to clear the lake. This is a comparatively short par 3 but isn’t an easy hole at all. 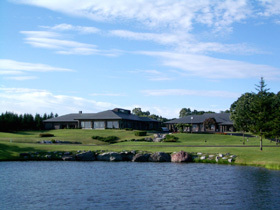 A lake guards in the front, but also the left and back of the green. To make things more complicated, there are bunkers in front of and back of the green. Accuracy with exact yardages is required on this hole. A long, straight par 4. The second shot needs to clear a lake. A chip shot off the green will be difficult. It takes 20 minutes drive from Chitose Airport. It has sauna facility. Visitors can book the tee-time trough Internet golf agencies. The course was awarded 8th place in 2002’s Japanese golf course rankings sponsored by Japan Golf Classic Magazine. The other courses in Japan designed by Jack Nicklaus are Ishioka GC, Rokko Kokusai GC, New St. Andrews GC Japan, Hibikinomori CC, Japan Memorial GC, St. Creek GC, The Tradition GC and Oakmont GC. Within top 100 Japanese golf course rankings, Siichi Inoue has the largest number, (17). Second is Robert Trent Jones Jr, (10), third is Jack Nicklaus (7), and fourth is Osamu Ueda (6).